We all know it’s not safe to text and drive or even drunk text for that matter. Now add a new one to the list. Never text from a movie premiere. Especially if you’re Ryan Murphy telling Jane Lynch she’s hosting Saturday Night Live. It is true that Jane Lynch will host Saturday Night Live in October, but how she found out is the kicker. Glee creator Ryan Murphy notified Jane Lynch of the hosting duties by accident. Gotta love texts for spilling the beans. 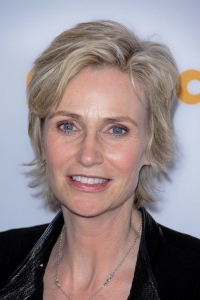 Jane Lynch, who made Glee’s witty and sarcastic cheerleading coach, Sue Sylvester, a household name, is up for an Emmy in August. Glee itself has been running rapid with the release of guest star cameos like John Stamos and most recently announcing a Britney Spears Glee episode. Gleeks get ready because Glee is returning for its second season September 21.